Intrigued to know where the Leadership Studies Sequence can take you academically and professionally? Want to hear from current students and professors in an informal environment? If you want to be influential, you have to develop your networking skills. The good news is that they can be developed! Join Professor Jay Conger, Henry R. Kravis Chaired Professor of Leadership Studies, on Monday, November 5th from 4:30 p.m. – 6:00 p.m. in Kravis 451 for “Never Eat Alone Again: Becoming a Masterful Networker" Workshop. In this workshop, you'll learn about your own approach to networking and discover your strengths and limitations as a networker. You will also learn the techniques that the best networkers in the world deploy to make things happen. Best of all, you will learn how much fun it can be to network...even if you are intimidated by the idea of reaching out to strangers. Please RSVP by clicking here no later than Saturday, November 3rd at 10:00 a.m. Dinner will be provided. The Women and Leadership Alliance (WLA) and Claremont McKenna College are excited to launch the Women and Gender Leadership Initiative. This two-part initiative consists of program facilitation and the funding of student proposals focused on student education and engagement around gender and leadership. Learn more about opportunities for the upcoming Fall 2018 semester! This workshop is designed to provide an overview of basic board governance concepts that arise from the duty of care, loyalty and obedience sourced from the California Corporations Code. A review of regulations and the rule of law plus standards of accountability, best practices and standards for excellence help board members and executive directors understand their role as stewards and visionaries. This year's retreat will be held from May 13-19, 2018 in Lake Elsinore, California. Is leadership an art or science? Are leaders born or made? Are penguins really jerks or simply misunderstood rising leaders? And what about elephants? What do they know about leadership? Damon Leon Packwood is co-founder and executive director of Gameheads, an organization that trains low-income and first-generation students ages 15–24 in video game design and development to prepare them for careers in the entertainment and tech industries. Damon has more than 18 years of experience in the youth development and education fields, with positions at Juma Ventures, Hack the Hood, and Upward Bound. Chopped meets Fear Factor! We will be hosting the first ever CHIRPPED Challenge where student chefs will make their favorite dish using cricket flour! Winners will receive $500 and their recipe will be included in Six Foods Cookbook! Audience members will have a chance to tantalize their tasteBUGS and win Six Food SWAG and other prizes! Shark Tank winner and Six Food Co-founder, Rose Wang and Chopped! winner, Chef TK will be joining Collins Executive Chef to judge the competition! Sign up here if you'd like to attend or compete in the Chirpped Challenge! Your name will be left at the main (east) entrance at Collins. You will NOT have to pay or swipe. Laura D'Asaro and Rose Wang are the co-founder and chief operations officer of Six Foods, a company that works to normalize insect consumption as a sustainable source of protein. Business Insider named Six Foods as one of the top ten startups changing the future of food, and they have one of the most funded food Kickstarters to date. Keno Sadler is a social entrepreneur, conference speaker, facilitator, and educator. While leading programs designed to shape the lives of young African American men through close guidance from older males, Keno began his 22-year relationship with the Breakthrough Collaborative as a teacher in the Miami and Fort Worth programs before creating and leading the Atlanta program which graduated over 90% of its students into college and introduced hundreds of college students to careers in education. The Women of Color Power and Purpose Forum focuses on developing and actualizing passion, cultivating skills for asserting your presence, and navigating and achieving your personal and career goals. The conference is a collaboration between the CMC Care Center, Kravis Leadership Institute, and the Berger Institute. Register here & read more about the speakers! This year's Kravis - de Roulet Leadership Conference will be convening award-winning social entrepreneurs, innovators, researchers and funders: people pioneering new strategies that are changing systems, improving lives and transforming communities. Join us for a highly interactive and energizing event as we explore new research identifying best practices for organizational success. KLI is offering TWO internship opportunities with the Forum for African Women Educationalists (FAWE), 2008 Kravis Prize Recipient. FAWE is a pan-African Non-Governmental Organization working to empower girls and women through gender-responsive education. We have an internship in Benin (Handshake ID# 1335583) and in Senegal (Handshake ID# 1335649) with FAWE’s National Chapters in those locations. Applications are due Wednesday, February 28 by 11:59pm on Handshake. Yscaira Jimenez is a Dominican immigrant from the Bronx. Yscaira is inspired by the substance addiction and incarceration struggles of people in her life and feels compelled to use education and employment to break the cycle of poverty. Yscaira is the founder of LaborX, a job matching platform for entry level candidates with non-traditional educational backgrounds and underrepresented folks. Women's Business Enterprise National Council's (WBENC) Student Entrepreneur Program application is now live! Applications are due on February 23, 2018. Accepted students will participate in WBENC's SEP free of charge. The program description from the website states: "Aspiring collegiate female entrepreneurs studying in STEAM (Science, Technology, Engineering, Arts, and Math) or Business receive mentoring from some of the most successful Women's Business Enterprises and America's largest Fortune 500 companies while also participating in a tailored entrepreneurial curriculum, a pitch competition awarding $20,000 in seed capital and experiential learning through off-site visits to Women's Business Enterprises, corporate campuses, and accelerators." Women are underrepresented in leadership positions, and recent data suggest that women earned 83% of what men earned. The goal of the conference is to empower women with the skills to acknowledge, and embrace their worth! Learn evidence-based, effective skills for negotiation, as well as strategies for fostering and building strong, supportive mentoring relationships. The conference is designed for 7C college students and alumni at all stages in their professional development. Join us on Monday, February 19th at 6:30PM in Kravis 321. Please bring your questions for an intimate and interactive dinner with this accomplished world-changer. Join psychology professor and Academic Director of the Kravis Leadership Institute, David Day, for a discussion of the state-of-the-art science of leader development during the upcoming Family Weekend! Are you interested in sustainability? Do you want to make an impact in your community? Have you ever heard of Homeboy industries? If so, you have an amazing opportunity to come meet Kabira Stokes, CEO of Homeboy Industries Recycling. Learn how Stokes merged criminal reform with environmental consciousness, and get FREE DINNER while you’re at it. Join us on Monday, February 12th at 6:30PM in Kravis 321. Please bring your questions for an intimate and interactive dinner with this accomplished world-changer. We're excited to launch our first speaker of our Dinner with World Changers Spring Mix! Every Monday, we'll be hosting movers and shakers, name takers and deal makers who are literally changing the world for the better! 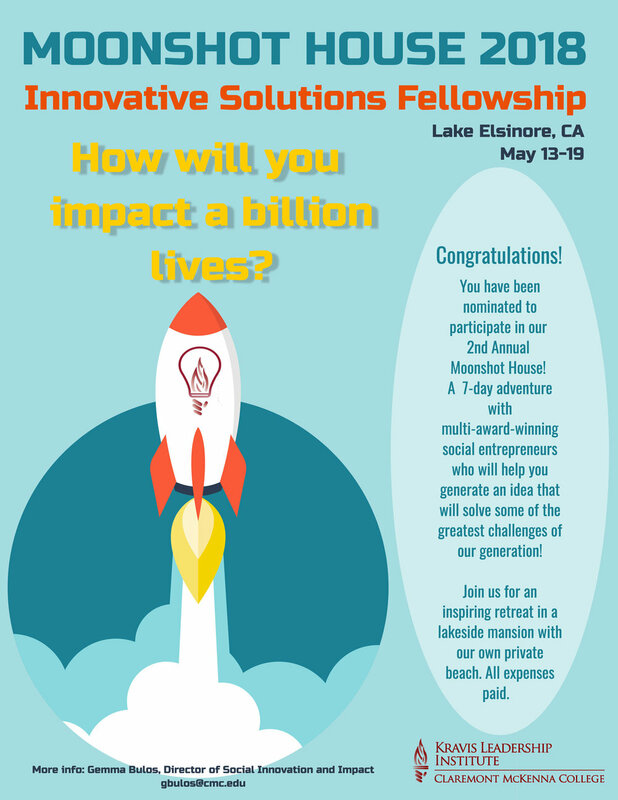 Every Monday from Feb 5-April 16, KLI Programs will be hosting an award winning social entrepreneur - from a Forbes Change the World Winner, a White House Champions of Change, Shark Tank deal makers to a Dalai Lama Hero of Compassion Winner - every week they'll be dishing out supersized doses of inspiration and innovation! This Monday, want the chance to have dinner with an internationally recognized winning social innovator, inventor and entrepreneur who is uplifting grassroots women and making sure girls stay in school in Rwanda? On Feb 5 you have an amazing opportunity to learn what it takes to build an impactful and successful social venture from the ground up from Elizabeth Scharpf, Founder of Sustainable Health Enterprises (SHE). Read more about Elizabeth below. KLI Academic Director, David Day, will be leading a leadership workshop “Leading and Influencing Without Formal Authority” on Friday, February 2, from 3:00 p.m. – 5:00 p.m. in Kravis 367. This is a great opportunity to learn and practice proven techniques to influence others ethically and effectively, use the power of persuasion to achieve results, and acquire the language to describe this valuable skillset to potential employers. Please RSVP here (space is limited).